This article discusses the flagship 360 MW/1440 MWh battery energy storage systems (BESS) project that has been launched by Eskom. It looks at storage technologies and their evolution, with particular reference to BESS of LiIon, NaS and redox flow battery technologies. Energy storage programmes that are being rolled out in the world are outlined. The various use cases of BESS are covered, such as energy arbitrage, peak clipping, frequency support, volt/var support, deferred transmission and distribution investment and quality of supply improvement, PV smoothing, renewable energy firming, spinning reserves and black start. Duty cycles expected of the BESS systems and the economics thereof for customers and utilities are explained. 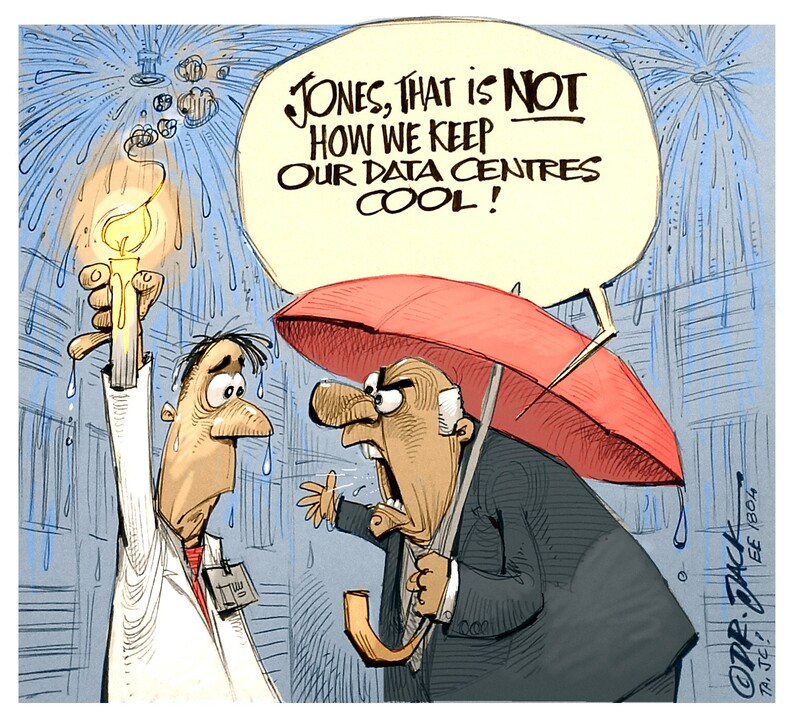 Finally, the article proposes some guidelines for the specification, testing, operation, maintenance and disposal of BESS systems and potential for wide-spread application on the South African power system. 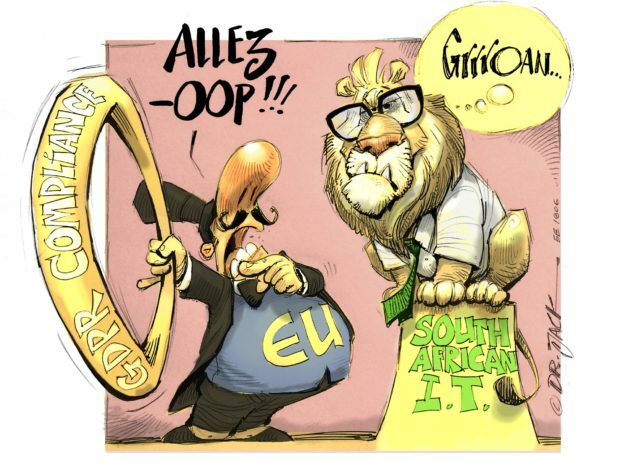 Eskom is South Africa’s electricity utility, responsible for 95% (220 TWh) of energy supplied within the country. The utility manages a power system with peak capacity of 35 GW. The power system in South Africa has evolved with the introduction of renewable energy independent power producers (REIPPs), while at the same time, energy sent out declined with an annual rate of 0,6% (Draft IRP 2018, p.18). Eskom’s share of the market has therefore not grown. The latest draft integrated resource plan with an outlook to 2030 has the following allocations: 7598 MW for PV and 11442 MW for wind. This represents a more than five-fold increase each for PV (2018:1484 MW) and wind (2018: 1980). In total, it moves PV and wind from 7,2% installed in 2018 to 25,6% installed in 2030, a 350% rise. In its application for funding of the new large coal-fired power projects, Medupi and Kusile, each of which are 4800 MW in size, Eskom committed to executing power projects utilising clean technologies. The 100 MW Sere Wind Farm project is one. Plans for a 100 MW CSP plant were discussed in 2015 but it was resolved in 2017 that Eskom should rather roll out a project on distributed battery energy storage systems (BESS) with some PV. 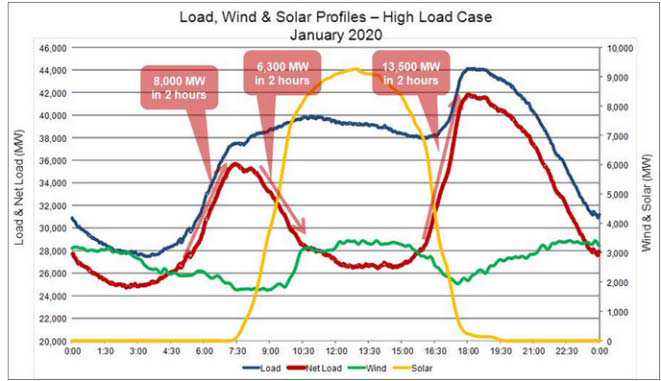 The sizing of the BESS would be similar to the energy the CSP would have generated, which is 1440 MWh per day or 525 GWh per year (100 MW at 60% load factor). Internationally, storage programmes have been launched in the USA, Europe and China. The USA programme in California is called the Self-Generation Incentive Programme (SGIP) and in 2013 set a target of 1,3 GW of storage by 2020. The majority (85%) of this is utility-based with the balance being customer facing. The European Union has approved plans to inject €200-million into a programme to develop battery storage manufacturing capacity (Energy Storage News, 14 Nov 2017), in addition to €150-million already allocated. Demand is expected to rise more than eleven-fold by 2025 (from 10 to 117 GWh per annum) by 2025. China is expected to trail only the US by 2022 in demand for battery energy storage (4 GW/10 GWh vs. 8 GW/21 GWh). The US DoE compiles a list of storage projects and publishes them on its website (www.energystorageexchange.org). Anyone can submit their projects online. Energy storage solutions have been in existence for many centuries, but electrical energy storage development started in the second half of the 20th century. Fig. 1 shows the spectrum of solutions ranging from high capacity mechanical solutions, mid-range chemical solutions and through to the new and emerging electrical solutions. Fig. 1: Electrical energy storage systems (Fraunhofer ISE). BESS solutions fall within the chemical/electrochemical part of the spectrum. They are mid-range solutions. Fig. 2 shows another view of storage solutions taking into account their capacity. Fig. 2: Electrical storage solutions capacity. It is important to note that while the Eskom project is targeting mid-range utility-scale applications of NaS, Li-Ion and Flow shown above, technologies are developing very fast leading to greater capacity and lower cost. BESS deployment is growing internationally, with estimates at about 1 GW growth per annum (see Fig. 3). Fig. 3: Growth of BESS deployment per annum. Fig. 4 shows the reduction cost of energy storage systems. Fig. 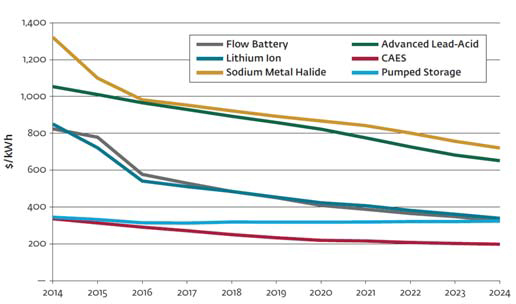 4: Trends in the cost of utility-scale battery storage systems (Navigant Research). 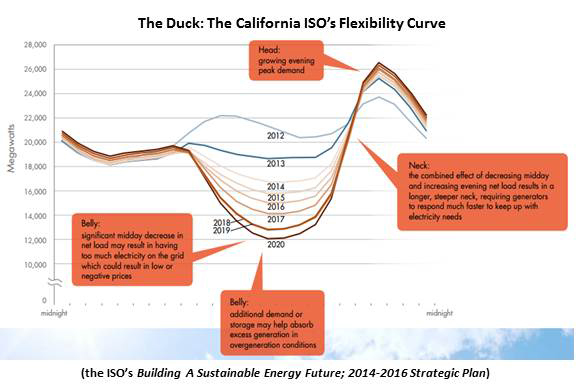 The CPUC SGIP programme referred to previously has accelerated the deployment of BTM and FOM BESS in California, triggered by their efforts to address the excess generation of PV during the day and extremely high ramp rates during the peak times, a phenomenon that has resulted in the famous “CAISO Duck Curve” (see Fig. 5). 1,3 GW has been approved for implementation, which is 6,5% of a morning peak of 20 GW. Fig. 5a: CAISO duck curve. The BESS architecture involves a battery management module which is a chemical storage medium which is integrated into the grid using AC/DC and DC/AC converter/inverter systems. Fig. 6 shows that the conversion/inversion is achieved through a PCS and the overall system is managed by an energy storage control system, sometimes called an EMS. Fig. 6: BESS system architecture. A balance of system installation is included which maximises the efficiency of the BESS through HVAC systems, and provides safety features such as fire protection. The applications of BESS are highlighted below in summary format. The economic value proposition for some applications is presented, with formulas. Energy arbitrage is where energy is stored during low generation cost/tariff periods for despatch at high generation cost/tariff periods. For as long as the system inefficiency does not exceed the cost differential, the business case may be positive. The discharge of energy at a predictable capacity factor during peak times can be used to reduce peaking capacity thereby saving costs. Fig. 7 shows both energy arbitrage and peak shaving. Fig. 7: Energy arbitrage (discharging at peak) and peak shaving (new flatter profile at peak). BESS systems have a very fast response, much faster than synchronous systems. Fast deployment can have additional benefits, especially when coupled with traditional non-instantaneous spinning reserves such as gas turbines that may take minutes to reach rated output. BESS capacity can be used in power mode (short duration), as a generator or load, to provide fast capacity support that can arrest frequency excursions. Frequency must operate within the ROCOF curve. Similarly, BESS capacity can be used in power mode (short duration), as a generator or load, to provide fast voltage support that can arrest frequency excursions. This can be battery capacity power or non-battery reactive power in static var compensator mode. BESS can be used to ride short-duration quality of supply phenomena such as voltage dips and flicker. BESS can be used to augment capacity and support the system at critical times of the day, thereby avoiding what can be costly investment in infrastructure upgrade. PV smoothing involves the storage of solar energy during the day for despatch at peak times. This function enables utilities to maximise the amount of solar that can be tolerated by the system in that both supply and storage can be done. All this is subject to non-violation of system inertia requirements. Battery storage can be sized to complement variable wind generation. When wind is above the set limit, the BESS is charged. It is discharged when output reaches a lower threshold. Similarly to PV, affordable storage can made wind despatchable. In UPS mode, a BESS solution can be used as a back-up power supply. The microgrid function enables the BESS to be deployed with renewable energy in a decentralised grid arrangement. Most BESS chemistries have a lifetime that is dependent on duty cycle. Li-ion batteries can last up to ten years, NaS last 15 years, while flow batteries have a theoretically unlimited lifecycle. BESS duty cycles range from a few hundred operations per year for simple functions such as energy arbitrage, where the unit may be called upon only twice a day for weekdays, to several thousand operations per year for frequent short duration applications such as frequency and voltage support. For high duty functions such as frequency support, it may become necessary to prepare a baseline of the frequency excursions in order to size the unit appropriately. Similarly, for wind energy firming, annual wind profile and wind farm sizing can be used to estimate the BESS duty cycle. A BESS specification includes critical parameters such container dimensions, weight, operating temperature range, chemistry, round-trip efficiency, fire safety systems, rated continuous power charge and discharge and communication protocols. The battery module, inverter and balance of system specifications are implied in these parameters. Included in the specification are all requirements for augmentation and disposal of parts. Service life is commonly set at 20 years. Evaluation of offers that meet technical specifications and other contract requirements is on the basis of lifecycle costs, being capital, energy inefficiency, maintenance, augmentation and disposal costs. Testing is prescribed in various specifications, such as IEC 62933-2-1, IEEE 2030, etc. Factory acceptance tests include tests for power and energy rating, round-trip efficiency, accelerated ageing, response time, ramp rate, auxiliary power consumption and self-discharge. 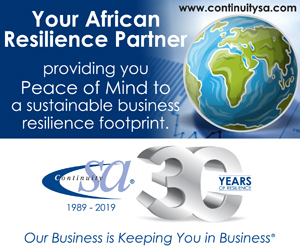 Site acceptance tests include tests for grid connection, antiislanding and quality of supply capability. The BESS unit has a local operation mode and a remote operation mode. It relies on regular input of set parameters to which it responds as programmed, e.g. voltage droop. BESS require maintenance of the battery storage module, the inverter and balance of system. A two year warranty will usually be included with the supply of the solution. This includes responses to planned (preventive) maintenance events as well as unplanned/faults or corrective maintenance. Maintenance taken over by the utility for the life of the asset immediately after warranty. Monitoring of the BESS solution is expected. This includes the DERMS function as well as monitoring the end-of-life of critical components such as the battery module. End of life estimation is critical in order to correctly time the implementation of necessary interventions to maintain the intended functionality. The environmental impact of BESS is analysed throughout its lifecycle, covering manufacture, use and disposal. Disposal requires careful attention, especially where the chemicals have a potential to pollute the environment. Recycling is a favoured option wherever possible, and dominant technologies such as Li-ion still have a long way to go reach levels achieved by lead-acid batteries (EPRI Journal, January 2016). The Eskom BESS project involves deployment of solutions at multiple sites in various operating units (OUs). Solutions range in size from 1 to 60 MW. The average size of an installation will be 4 MW/16 MWh, which implies about 90 installations in all. All solutions will have a primary function and supplemental functions in the form of “stacked benefits”, in order to maximise the value of the BESS. For example, a unit primarily meant for capex deferral during peak times in winter months will be available for functions such as frequency support at any time and peak clipping during summer months. Peak hour discharge shall be for four hours. Fig. 8: Process flow for the BESS project. Use cases have been extensively written about and are found in key SANDIA, EPRI and IEEE documentation. The most attractive applications are for distribution deferred investment and congestion management, and this was prioritised wherever possible. Each participating OU identified potential sites. Where local benefits were not immediately available, substations sites in electrically remote OUs were chosen. An attempt was made to prioritise sites that result in upstream congestion and a reduction in losses. These sites will provide losses benefits in addition to displacing peak energy (kWh) and demand (kW). This step involves assessing the business benefit of deploying BESS versus other viable options (such as new distribution/transmission substations and feeders, installation of voltage regulators, additional peaking power generators, etc. ), and where the investment is recouped within a reasonable timeline. Project justification is based on direct benefits such as reduced distribution bulk purchase costs, and indirect benefits such as reduced overall generation costs. The DERMS will be integrated into the SCADA to provide a seamless transition between network conditions and BESS deployment. It will effectively manage a “BESS fleet”. The life management of BESS units is critical as some chemistries tend to degrade over time, leading to the technical benefits not being fully realisable. It is therefore important to monitor the unit, in particular the chemical storage unit, for end-of-life. This is achieved through the APM tool. Permitting involves sourcing land and conducting environmental impact assessments in line with relevant legislation. The evaluation criteria involves preliminary assessment, technical assessment and finally economic lifecycle assessment. The lifecycle phase considers capital cost, energy cost (inefficiency), maintenance cost, replacement/augmentation cost and disposal cost. Future areas of focus in the understanding of BESS, after deployment, are analytics, generation use cases and detailed technical planning studies. 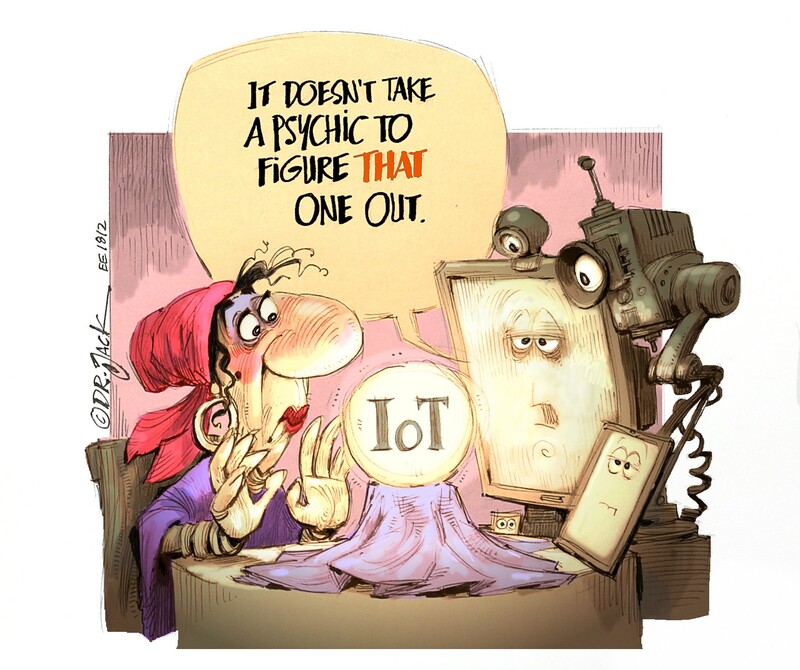 Analytics will involve history of deployment, operating costs, revenue earned, ageing mechanisms and ageing rates. 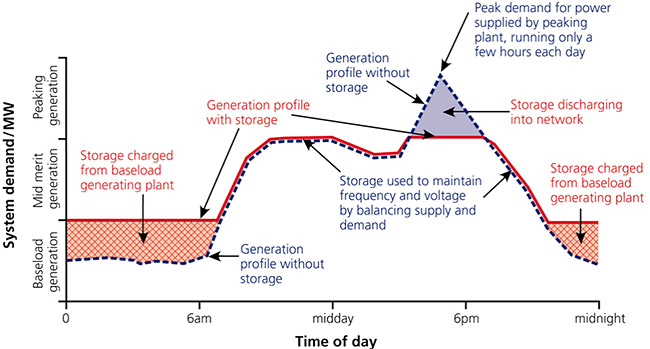 Generation use cases to be studied include provision of generation-scale instantaneous reserves coupled to traditional non-instantaneous reserves, emergency backup and black start capability. On a system-wide level, a key variable to understand is the limit of the South African power system to host inverter-based generation. This is important because system inertia is always required in order to enable the system to recover from faults. It is interesting that the IRP 2018 draft document recognises this (p.38). One opportunity that has been missed in the draft IRP 2018 is to guide the determination of additional energy storage. With costs declining as they are, the document needs to prepare the industry for these solutions. Where viable, the utility and end-customers will deploy BESS even with no framework in place, in particular to defray peaking power costs. There is an opportunity for South Africa to develop an ancillary market that would make the business case for BESS more viable. BESS has clear business value at a local and network level. Various use cases have been presented to indicate this. South Africa is increasing the share of variable renewable energy to 25% in the draft IRP. This will result in steep ramp rates for traditional plants and to mitigate this impact, BESS solutions could be utilised. South Africa must develop an ancillary market in order to stimulate investment in solutions that will support grid flexibility. Allocation of inverter-based variable RE and BESS must be limited to the minimum inertia that the system should have. This must still be studied in detail. 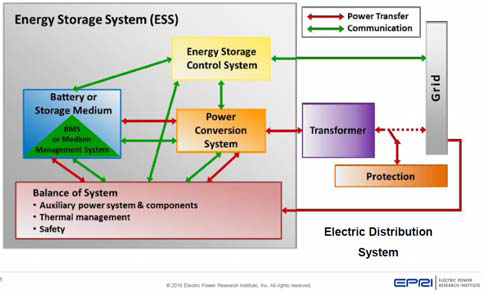 EPRI: Energy Storage Technical Specification Template, 3002006673, October 2015. 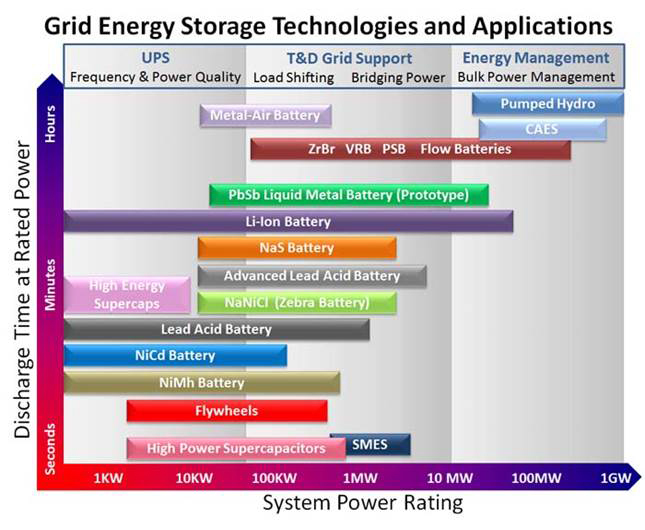 EPRI: ESIC Energy Storage Implementation Guide, 3002010896, December 2017. Chris Warren: “EPRI Examines Environmental Aspects of Grid-Scale Battery Deployment”, EPRI Journal, January 2016. IEC White Paper: “Electrical Energy Storage”. IEEE: “Draft Guide for Design, Operation, and Maintenance of Battery Energy Storage Systems, both Stationary and Mobile, and Applications Integrated with Electric Power Systems”, P2030.2.1, September 2017. Cigré: “The Impact Of Battery Energy Storage Systems On Distribution Networks”, Cigré WGC6.30, 2014. Mark Chediak: “The Battery Will Kill Fossil Fuels—It’s Only a Matter of Time”, Bloomberg, March 2018. 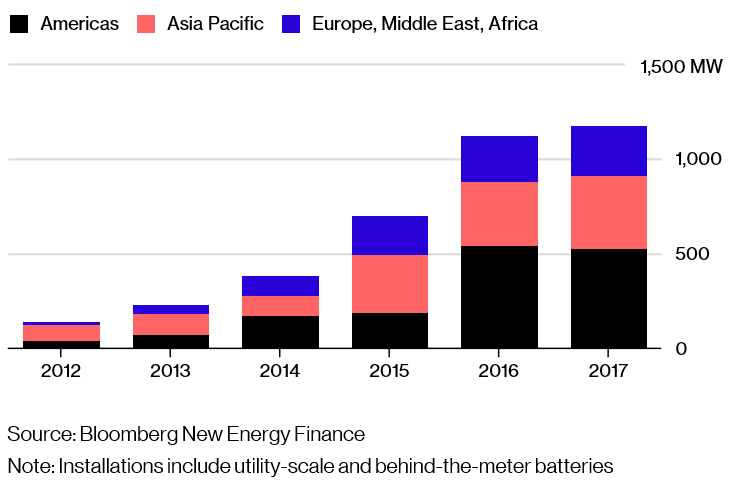 Bloomberg New Energy Outlook, 2018. PNNL−22010 Rev. 2/SAND2016-3078 R: “Protocol for Uniformly Measuring and Expressing the Performance of Energy Storage Systems”, April 2016.